Surf into matrimony with a wave ring. Surfer wedding bands are not just for surfers. All types of people, from the beach crowd and metaphysical fans to the fashionistas, enjoy rings with the water symbol design. If you are looking for a modern wedding band that expresses a love for the ocean, consider a surfer ring. Whether you are dedicated to surfer culture or simply love the wave design, the surfer theme is a meaningful nautical wedding band selection. 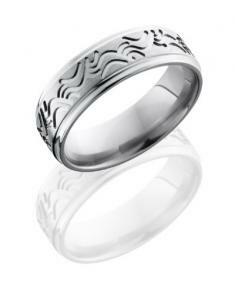 Each surfer wedding ring depicts a water symbol such as a wave. The water symbol is appropriate for a wedding because water represents life, unity, purity, fertility, and fidelity. Couples who are planning a beach wedding may desire a ring that symbolizes their union and love of the water. Beach Life: Couples who enjoy spending time together at the beach may enjoy a surfer wedding ring. Sailing: People who like to go sailing or boating together may also find a surfer theme romantic. Water Sports: The couple who spends a lot of time swimming, diving, water skiing, or surfing will also find a surfer theme meaningful. Fishing: People who like to fish together may also like a water style ring. 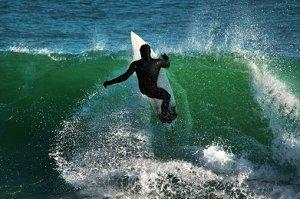 Surfer culture describes a lifestyle that revolves around surfing and similar water sports. A specific fashion, rituals, and jargon are associated with surfer culture, and it can vary by location. For example, Australian surf culture is very different in jargon and dress than Californian surf culture. Surfer culture began in the early 20th century but did not become popular until the 1950s, when music, literature, and films about surfing culture appeared. Surfer culture soon grew to include people from all economic groups, races and ages. Surfer culture also includes a spiritual or religious element. In fact, Australian surfer Nat Young unsuccessfully tried to register surfing as an official religion. A surfing wedding ring may hold special significance for a couple who feels a spiritual or religious connection to water and the surfing sport. Many surfer wedding ring styles are available. You can find simple or intricate designs made out of a variety of materials, all depicting some form of a water symbol or wave. Waves range in design from a distinct wave pattern to artistic flowing lines. The rings are usually made out of different precious metals such as yellow or white gold, platinum, or titanium. Sterling silver and stainless steel wedding rings are also available and are perfect for couples on a budget. More unique wedding rings can also be made from pewter, copper, and resin. Some surfer wedding rings are all metal. The rings are often two-toned to emphasize the wave pattern. Others include a gemstone such as a diamond that may be surrounded by a wave curl. Michael C. Fina: This jeweler's line includes an 18K white gold surfer ring with an artistic design. Arnold Jewelers: The site carries an 18K white and yellow gold two-toned ring with a highly detailed artistic design. Gillett's Jewelers: This Australian site has a large selection of surfer wedding rings. The collection includes a men's 9K white gold ring with a chunky wave design, an etched wave style ring, and a women's two-toned 9K white and yellow gold ring with an artistic wave pattern. Amazon: Amazon carries surfer rings made out of white and yellow gold, sterling silver, and pewter. deSignet International: deSignet offers two custom ring designs featuring waves. One ring depicts a Celtic wave pattern and the other ring features a single wave with a diamond. Surfer wedding bands appeal to couples with a variety of tastes and budgets. Many jewelry artists have created unique interpretations of water symbols or added beauty to the traditional wave pattern. Anyone searching for a simple but elegant ring with subtle symbolism should consider a surfer wedding ring.